The Science of Sport: Dear Sports Scientists: Will drinking fluids keep me cool? First, if you did not catch the NY Velocity interview with Ross, be sure to---Andy Shen and co do a great job over there and produce some excellent interviews. Their site is a must read for any serious or enthusiastic cyclist, whether or not they reside in NYC. Back in June I was very fortunate to present two sessions at the National Athletic Trainers Association annual meeting in Philadelphia, PA. Both talks were about fluid ingestion, temperature regulation, and dehydration, and last week I received the audience feedback from the two sessions. As usual the sessions produced polarized views on the subjects. So I thought it might be a good time revisit this topic, one we have written about quite a bit on the site and in The Runner's Body. After all, it is the end of summer, it is hot and humid, and plenty of people are training and racing in the heat. The title of this post was not inspired by an email we received, but one of the core junctures where the two sides of this argument split is how much fluid is the right amount and why athletes should ingest it. Nearly everyone will agree that ingesting fluid does have an effect on one's ability to regulate core temperature. However one side of the argument is that athletes should try to maintain weight losses or lose less than 2% of their starting mass, while the other side feels ingesting fluid to thirst (which normally results in weight loss and some "dehydration") is the best practice. Why ingest the fluid to prevent or minimize weight losses? Well, some might argue that if we do not, we get too hot and this predisposes athletes to "heat illness." The exact meaning and relevance of "heat-illness" is debatable and probably deserves its own post altogether, but the rationale for warding off dehydration by minimizing weight losses is that dehydration causes a rise in core temperature, and that causes heat illness, and that it might even cause heat stroke according to some. The evidence used to support the practice of replacing all or most of your weight losses comes from studies that control for the workload while asking subjects to run or cycle in hot and humid conditions. The smaller scale studies measure weight losses (and sweat rates) and core temperature, the larger scale ones look at cardiac output and skin blood flow, among other variables. This is good science, because if we permit our experimental subjects to speed up and slow down then suddenly we cannot determine what is affecting core temperature because now we have two independent variables (intensity and fluid volume) instead of one (fluid volume). Therefore I am not slating those studies and authors and accusing them of bad science. The conclusions are that dehydration, as measured by weight losses, increases cardiovascular strain and results in an elevated core temperature at the same workload. Fair enough, and as I mentioned earlier I do not think anyone, us included, will try to say that fluid ingestion has absolutely no effect on core temperature---it does, and these studies all demonstrate this effect. And in fact their science is good, but it is the application of the conclusions that are bad. In writing a scientific paper it is quite easy to wander off and begin to speculate about why you found what you found. And it is at that point in your discussion that the reviewers let rip and often times sharply remind you to remain within the confines of your data and draw conclusions based only on what evidence you have available to you (i.e. your data)! The issue with this topic of fluid and temperature is that the data are all collected within a strict set of conditions---as dictated by the scientific process--but then applied to every athlete (slow, fast, recreational, competitive, elite) in any situation (practice, race, fun) and any condition (cold, warm, hot). The size and magnitude of this effect is terribly small, however. I try to teach my students in my stats class the difference between statistical and practical significance, and this is a classical exercise for this. Take the absolute difference between the core temperatures at the end of a typical study, where the subjects exercise for up to two hours. It is typically between 0.5-0.8 C, or maybe 38.x C in the fluid trial and <39.5 C in the no fluid trial. Statistically significant? Yes, most likely. Practically significant or meaningful? You are allowed to disagree, but I say "no." And to follow up with that conclusion, the advice to replace fluids and prevent dehydration is dished out from this evidence even though none of the subjects in these trials ever report signs or symptoms of "heat illness." So perhaps the real story is that even when we exercise in hot and humid conditions, our core temperatures rarely reach critical levels, and we cope with the additional stress just fine as evidenced by the lack of symptoms. To me it begs the question, "Why are we telling people to follow this practice," because although there is a difference in temperature, it is small and not otherwise meaningful. Long ago, in an exercise lab far, far, away (ok, in Fort Worth, TX), some bored or motivated (or both) students were testing an athlete preparing for the Honolulu Marathon. 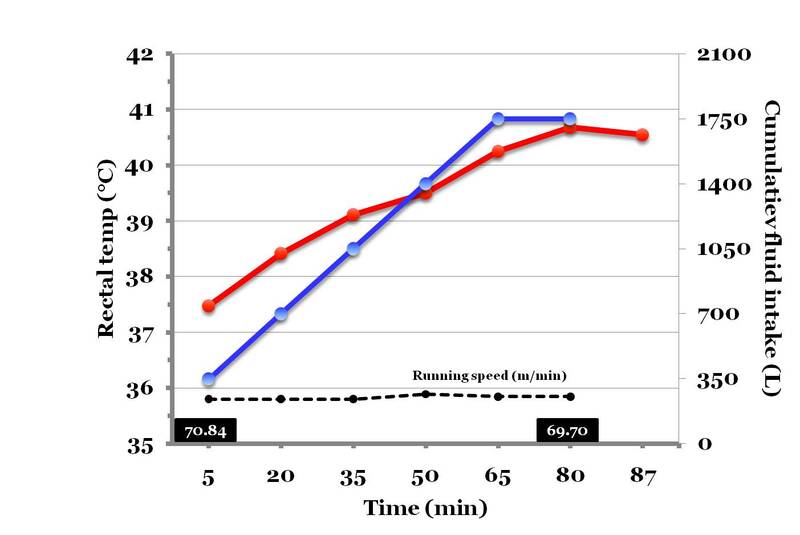 At the end of the heat acclimatization period, the runner did a performance run (80 min) at marathon pace (14-15 km/h, or 8.75-9.4 mph) and ingested quite a large volume of fluid (1.75 L) while we measured the rectal temperature response. He did not ingest quite enough water to prevent weight losses, but came pretty close, losing only 1.6% of his body mass pre to post. And by the way, the conditions in the heat chamber were 27.3 C and 60-65% relative humidity---the expected conditions on race day in December in Hawaii. So if the model is that you must prevent or minimize weight losses, and that you must do that to prevent an excessive rise in core temperature, and this model is based on the evidence I mentioned earlier, how does one explain the graph above? 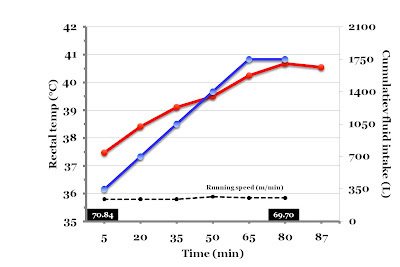 According to that model, this athlete should be no where near 40 C since he lost only 1.6% of his body mass and was only minimally "dehydrated," yet after 80 min he is nearly to 41 C. And herein lies a problem, because if some data do not support a particular conclusion, said conclusion must be scrapped and we must formulate a new one that incorporates all the available evidence. Therefore it is not the fluid you ingest that keeps you cool, but as we have written here before it is your metabolic rate, or how hard you are exercising, that really predicts your core temperature during exercise. Do not mistake what I am saying here, though---fluid plays a role, but only a very small one, and more importantly when we permit athletes to pace themselves they just slow down in the trials where they do not drink or receive very small volumes of fluid. The result is that they reach the same core temperature at the end of the time trial, but take a little longer to finish. For me the bigger message is that if performance is a desired outcome, if the runner wants to go as fast as they can, then they should drink to thirst. Ingesting volumes that are larger than that have not been shown to produce faster performance times. If performance is not important, the evidence from where I am sitting tells me that ignoring thirst and/or ingesting very small volumes of fluid will result in a miserable day out, but will not cause you to get heat stroke or collapse---two conditions that result from mechanisms other than changes in fluid balance. If using a "hydration system" and lugging an additional 1-2 kg of mass during training runs makes you feel better, then please continue, but just know that you are not lowering your risk for anything by doing so. The normal response is to replace less than what we lose, and it is perfectly normal and healthy to drink to thirst. Meanwhile, the Fall marathon season is upon us! Berlin is around the corner and Chicago is boasting a super hot field that, under optimal conditions, is capable of a record. Earlier we looked at the Joyner paper but left it before discussing what kind of running economy it would take to break two hours, so watch out for that analysis!